The small family of space faring nations just got a little larger. Iran for the first time launched a small communications satellite into orbit, joining the ranks of the United States, Russia, China, France, the United Kingdom, Israel and India. But how does a rocket really work you might ask. Well that's what Tuesdays are all about. Newton's first law of motion tells us that in order to get an object moving, we need to exert a force on it. As you can probably tell, thousands of tons of space craft takes a whole lot of force to get moving. That's why when you look at the diagram of a rocket; the vast majority of it is actually fuel tanks. When the fuel is ignited in the rockets engine, its stored up chemical energy is converted into a lot of mechanical energy that pushes the rocket forward. It's not difficult at all to figure out how much of a push is needed to move a rocket forward. Newton’s second law tells us that Force equals Mass times Acceleration (F=MA). In order to find out what kind of force we need to move the rocket, all we have to do is plug in some known facts. 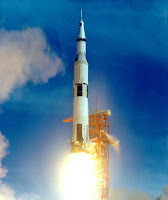 According to Boeing's website the mass of the Saturn V moon rocket with all of its fuel weighs nearly five million pounds, or roughly 2,250,000 kg. Gravity is always accelerating objects down at a constant 9.8 meters per second squared. Multiply the two together and you'll find it takes 22,050,000 newtons of thrust to send the astronauts on their way. When a rocket enters orbit and everything starts floating around the cabin, people often call this feeling of weightlessness "zero gravity," but that's not quite right. Earth's gravity is still pulling on the rocket, but everything feels weightless because you're actually freefalling. It's the same sensation you get when you're going down a big plunge on a roller coaster. The rocket is actually falling the entire time its in orbit, but the difference is, it's moving forward so fast, the ground falls away at the same rate. In the time it takes the rocket to fall ten feet out of the sky, the Earth has curved away ten feet. This continues all around the globe, until a complete orbit is made, and the process repeats itself. In order to totally escape the pull of Earth's gravity a spacecraft has to travel at least 11 km per second. That takes a lot of force to get going, which is why the moon rockets were taller than a football field and mostly fuel. Using Newton's second law, see if you can find out exactly how much force it would take to send the 45,000 kg Apollo spacecraft from Earth's orbit to the moon. Always wondered how something worked? Suggest it in the comments section and we can do a How'd They Do That Tuesday based on your question!